Volume 1A. Part 1: Agricultural Production. Production and supply (Y. Mundlak). Uncertainty, risk aversion, and risk management for agricultural producers (G. Moschini, D.A. Hennessy). Expectations, information and dynamics (M. Nerlove, D.A. Bessler). The agricultural innovation process: research and technology adoption in a changing agricultural sector (D. Sunding, D. Zilberman). Structural change in agricultural production: economics, technology and policy (J-P. Chavas). Land institutions and land markets (K. Deininger, G. Feder). Human capital: education and agriculture (W.E. Huffman). Women's roles in the agricultural household: bargaining and human capital investments (T.P. Schultz). Human capital: migration and rural population change (J.E. Taylor, P.L. Martin). Agricultural finance: credit, credit constraints, and consequences (P.J. Barry, L.J. Robison). Economic impacts of agricultural research and extension (R.E. Evenson). The agricultural producer: theory and statistical measurement [synthesis of 1A] (R.E. Just, R. Pope). 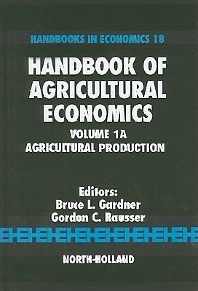 This first volume of the "Handbook of Agricultural Economics" presents work on topics central to the economics of agriculture: the quantitative representation of technology; market expectations; household production behaviour; consumer behaviour with uncertain quality and safety of goods; and issues of imperfect competition in food marketing. Volume 1A treats issues in agricultural production, representing the consequences of decades of work deepening and widening the original focus of agricultural economics on farm management. In addition to the theory and estimation of production and supply behaviour in agriculture, chapters are devoted to topics on which major advancements have been made: technological change; returns to agricultural research; the industrial structure of agriculture, land institutions and markets; and human capital and finance. Two chapters are further specialized to rural labour and household issues: migration and the role of women in developing countries.